The Indian motorcycle markets have seen a surge of options available for riders who want to go all-out, finding excitement in taking their motorcycles off-road. These riders will soon have another option to pick from, because Royal Enfield is almost ready with its much anticipated Himalayan motorcycle. This new model will be unveiled on February 2, 2016. A person familiar with the matter has informed us that the Himalayan has been tested extensively on rally stages in the Himalayas that would destroy most vehicles. However, the Himalayan proved to be capable of taking a thorough beating without any serious side effects. So you can expect a sturdier than usual RE that can tackle Indian roads with ease. However, on the engine front don't expect a rev-snorting, shrieking motor. The Himalayan's engine is expected to be very similar in character to the existing products. So RE traditionalists wont be disappointed. However you can expect some more revs to play around with. 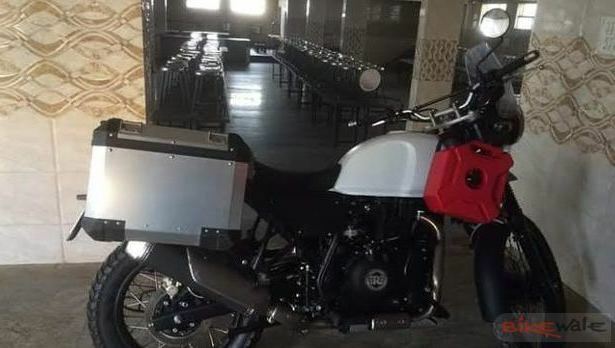 The bike has been photographed in production guise, and one can clearly see how the Royal Enfield Himalayan is designed to overcome the challenges presented by the mountains. Chunky off-road tyres, a high-mounted mud-guard on the front telescopic shock absorbers, a wind and rain shield over the headlamp, dirtbike-style chain tensioner, and brackets to mount luggage make their way to the motorcycle. What seems to be amiss is the quintessential underbelly-pan. The motorcycle might get two engine options – a 750cc twin-cylinder and a 410cc unit. Both these engine options have been worked upon by the manufacturer after an investment of about Rs 500 crore. RE will try to keep the engine smoother than the ones being offered on their current line-up. When it comes to conquering the mammoth mountain range in the North on two wheels, riders from across the country pick from the current line-up of Royal Enfield motorcycles. In fact, motorcycles from the manufacturer are often preferred over other brands by these adventure seekers. So what RE did was make a motorcycle that is purpose-built for the Himalayas. This Himalayan motorcycle will most likely come to showrooms in the next few months, and Royal Enfield might price it around the Rs. 2 lakh mark.